I thought that I would do a general entry this week on some games, activities, and books that are working well for me this week. If you're following along with the Pacing Guide, I'm on Week 4, and will reference that outline throughout the coming year. I’m very excited to share these ideas with you! 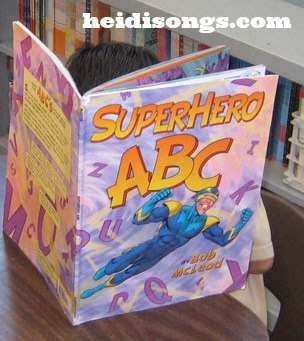 SuperHero ABC by Bob McLeod and the Zero the Hero song. 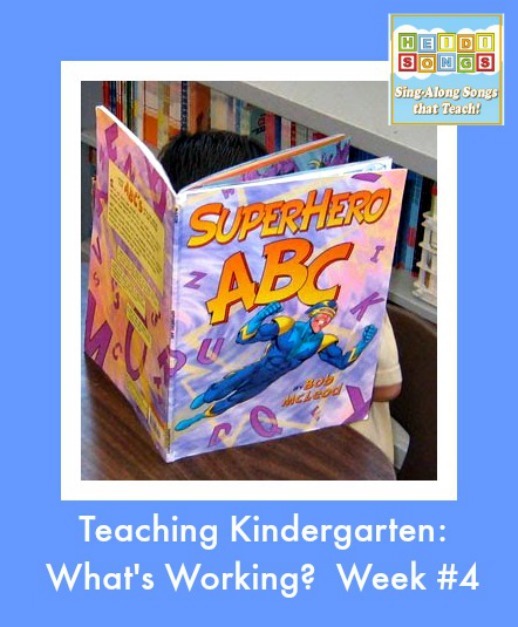 I found out about this little gem of a book last year on the Teachers.net Kindergarten teachers chatboard! I read it to my kids for the first time this school year this week, and they were enthralled! They absolutely loved the illustrations, and the alliteration in it is absolutely amazing! It also made them super excited to sing their newest favorite song, Zero the Hero from my Sing and Spell Vol. 5! Some of my students are still spelling it, “ZZRR!” or “EZOO!” or some other joyful combination of letters, but that is not bothering me! They are loving it and begging for the song. So I hold it over their heads as something to work towards if they are very good. Plus, whenever I hold up the word, “zero” and ask them what word it is, they all call out “zero!” So that’s a start! A third of them still don’t know more than a handful of letters yet, so I can’t complain too much! 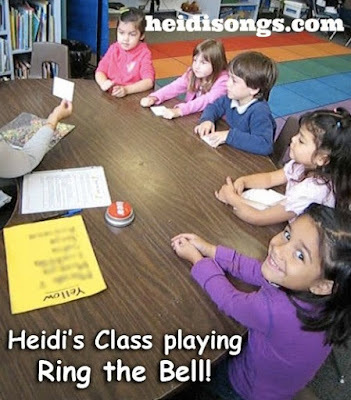 I made up this little game to be played in small groups, and I decided to call it “Ring the Bell!” It has a back to school/making new friends theme to it, and I use it to practice letters, numbers, and a couple of (very) basic sight words. Of course, you could use it to practice whatever concept you wanted. 1. The dealer holds all the cards, shuffling them before beginning. Try to put one “Ring the Bell! card on the bottom of the stack. 2. The dealer gives the first child a card. He tries to identify the card. If he cannot identify it, just tell him and have him repeat it. There is no penalty. 3. If the child receives a “special card,” then he must do the following things. Apple: The child has to give his apple card to the teacher. Snack Time! : The child gets a piece of cereal or some other treat. Write Your Name: The child tries to draw his or her name (or the first letter of his name) on a friend’s back. Be careful- it tickles! The Dog At My Homework: The child must give all of his cards to his teacher. Ring the Bell! : Ring the bell, and then you get all the cards at the table, (except for the dealer’s cards.) We use a Staples’ “That was easy!” button for the bell. The game continues until all of the cards are dealt. The child with the most cards is the winner. The children LOVE the Staples “That was easy!” button! And I appreciated that they were not ringing my freeze bell in the classroom, because I didn’t want the children to become “desensitized to the bell” by hearing it too often and not needing to freeze when they hear it. We have just posted this game for sale on our website as a download. My students this year seemed to need more practice on numeral writing than our Saxon math series was giving them, so I decided to pull out some of my old “Number Monsters” worksheets by Shirley Ross and Cindy McCord. This is a very old and really cute worksheet book that is so good that it is (of course) now out of print. It had a cute little monster on each page that had either one of each thing, or two of each thing, etc., such as horns, teeth, eyes, and so on. The children were supposed to search for and circle the target number on that page, and then on the back, practice tracing it and writing it lots of times. Each page featured one of these cute little monsters to color in and decorate. The book also had some pages with this wonderful poem and pictures that I had colored and laminated and made into a book that I read to my class each year when teaching the numbers. Etc., etc., etc.! And so it goes, on up to number ten. The kids always get a kick out of it, and it is a very quick read that they can participate in. The best thing about using the worksheets in the Clearboards this way was that we were able to work with some children individually, while the rest of the group was happily engaged. They had all of the worksheets from numbers one through ten in the clearboards (front and back), and that was plenty to keep a group of six busy for 15-20 minutes. With the Clearboards, there is nothing to turn in, (and nothing to correct!) so you don’t need to stress over whether or not they actually finished their work while they were there. They even used these same worksheets for three days in a row and were quite happy about it every time! I think that I may copy some individual pages for them later and let them each color a number monster to keep, since it was such fun for them. We have been working on learning the first of our sight words, and of course the word “the” is always the one to start with! So we learned the “The’ song last week from Sing and Spell Vol. 1, and now this week we made our first Mini Sing Along Songbook for that word. 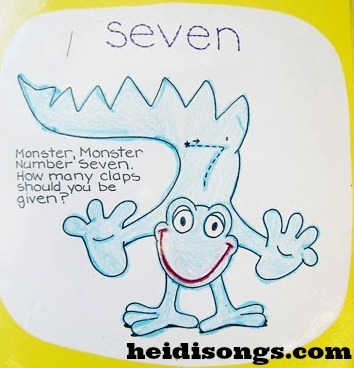 This came from the new set of Worksheets, Mini-Songbooks, and Flashcards to support Sing and Spell Vol. 1. I did expect them to like making the book, but I was really thrilled with their reaction to it! They were very excited to have their own little book to take home, and some of them kept exclaiming, “I see T-H-E! I found it! I see it! There it is!” They have started to notice the word in print all over the place, and it was really fun for them to make their own little book about it. They especially liked coloring the large print words at the end, and also rainbow writing the word as well. They didn’t know it, but by the time they were done with the little book, they had traced the word “the” six times, written it from memory twice, colored the chunky letter version of the word twice, and rainbow written it twice. (FYI, “rainbow writing” is just tracing it with lots of different colors.) And during the entire time that they were working, I continually asked the children to tell me what word they were working on. And most of them spent that time also singing the “The” song while they were working! I sure wished I had had my video camera with me that day! I always seem to miss the cutest moments due to that very problem! We used Crayola Twistable Pencils to color our mini-books, and that worked out great. I love using those in the classroom! I usually buy five or six new packs at the beginning of the year, and they last til the end of the year and beyond. The only problem is that we are now low on certain colors, and I will need to restock soon. Summer is hot. Hot, hot, hot! We ride our bikes and skate for fun! ‘Cause summer is hot. Hot, hot, hot! You are very creative and have helped me get ideas to go with the picture books I've had published. I can't wait to start getting your newsletter. Heidi, I LOVE your blog and products. I recently discovered you and am so happy that I did!! I found a Number Monster book on Amazon for a reasonable amount. I have found it extremely useful. I also just made my own Senorita Same Sound. She is just adorable!! I can't wait to use her on Monday! Thanks so much for inspiration and ideas. I love your site--am learning so much from you!!! Couldn't you use page protectors instead of Communicator Clearboards? They're probably a lot cheaper. Yes, page protectors do work, but they don't work as well. The kids really like the way the markers slide around easily on the Clearboards. The teachers at my school that have borrowed my Clearboards and then used their own page protectors say that their children much prefer the Clearboards. Yes, it is cheaper to use the page protectors, but I do think it is worth the investment to get the boards if you can because they can be used over and over in so many different ways.